However, nutritional management of pancreatitis continues to be guided primarily by the human literature and clinical experience due to lack of controlled clinical trials. Any nutritional intervention in the treatment of pancreatitis is predicated on the practitioner distinguishing acute or chronic pancreatitis from other causes of gastrointestinal signs. FIGURE 1. Ultrasound images of pancreatitis demonstrating (A) heterogeneous echogenicity in the pancreas of a dog affected by chronic pancreatitis and (B) significant pancreatic enlargement, hypoechoic regions in the pancreas, and adjacent hyperechoic peripancreatic fat in a dog with acute pancreatitis. In most patients, the definitive cause of pancreatitis is unknown. Published risk factors for pancreatitis are extensive and include endocrine disease, obesity, breed, and others.1-6 The nutritional factors that are anecdotally reported to precede episodes in dogs include dietary indiscretion and consumption of more dietary fat than normal for a particular dog. Cranial abdominal pain and nausea are thought to be characteristic of acute pancreatitis in dogs.1-3 Dogs with chronic pancreatitis may display vague signs of anorexia, hyporexia, lethargy, or behavioral changes, and an acute trigger may not be immediately identified in these patients. No objective information is available to determine whether fasting is associated with beneficial or poor outcomes in dogs with pancreatitis. The premise for this approach is to avoid both pancreatic stimulation and premature activation of zymogens, but these effects have not been demonstrated in clinical patients receiving nutritional support. Many veterinarians relate personal observations that early feeding is associated with increased nausea or morbidity, especially in the presence of abdominal pain or severe gastrointestinal signs prior to feeding. Early enteral nutrition accelerated recovery in dogs with parvoviral enteritis, with food administered by nasogastric tube irrespective of whether dogs were vomiting or regurgitating;7 however, the significance to older dogs and those with pancreatitis remains unclear. Enteral nutrition by jejenostomy tube maintained intestinal villous height and mucosal thickness better than parenteral nutrition in dogs with experimentally induced pancreatitis.8,9 However, this information may not be relevant to most practitioners, who will choose between fasting or enteral support, rather than intravenous nutrition. KEY POINT: Short-term fasting has not been associated with poorer outcome in dogs with pancreatitis, and the benefits of feeding require additional validation in dogs with naturally-occurring pancreatitis. The expense of feeding dogs with severe acute pancreatitis amounts to a small fraction of the overall care (< 5%), but these costs could be significant if the owner’s budget is limited. In the absence of evidence specific to canine pancreatitis, practitioners should evaluate the risks of enteral feeding in the context of the patient’s overall clinical picture. Dogs with intractable vomiting or regurgitation, in normal body condition, or those with owners who have financial limitations may tolerate a period of fasting without any clinically relevant adverse effects. FIGURE 2. 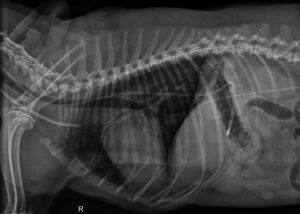 Radiographs should confirm placement of nasoenteral tubes; this lateral radiograph shows a nasogastric tube placed in a cat with the distal tip clearly evident in the stomach. KEY POINT: Maintenance of enteral nutrition appears beneficial in humans with critical illness and is likely worth the time and effort of intervention—when risks of feeding the patient are low—until additional studies are performed. KEY POINT: Enteral nutrition is generally associated with more favorable outcomes in humans and possibly in dogs when compared with parenteral nutrition. Dogs with pancreatitis should eventually achieve their estimated resting energy expenditure when feeding is appropriate and elected. The first formula is the more accurate of the 2 equations, while the second is an approximation of RER for dogs weighing 5 to 25 kg. Body weight should always be entered in kg. Animals may require assistive enteral feeding. Syringe feeding is not recommended due to the practical inability to deliver full nutrient requirements with this method and the risk of food aversion and aspiration. Nasoesophageal and nasogastric tubes are often used in management of canine and feline pancreatitis. Esophagostomy tubes are generally reserved for severe chronic pancreatitis in dogs, or in cats with concurrent morbidities that make the need for continued supportive feeding likely. What should the patient be fed? 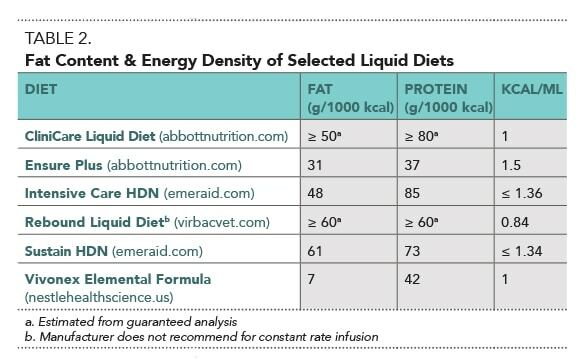 Commercially available low fat enteral diets (Table 1) may best be reserved for patients that have been discharged from the hospital or those that are severely hyperlipidemic. Initiation of therapeutic diets during acute illness has been hypothesized to risk food aversion to the diet offered, and only a limited number of fat-restricted diets are available on the market. Dogs fed a fraction of normal maintenance energy requirements tolerate a moderate fat “sacrificial” maintenance diet during hospitalization, in my experience. Veterinary-specific diets are usually higher in fat than human formulas but are complete and balanced. Human enteral diets may be used for short-term feeding as they are lower in fat but are generally also lower in protein and essential nutrients, making them inappropriate for long-term use without detailed analysis. Liquid diets are generally required for nasoenteral tubes. Elemental diets are liquid diets designed for humans. The name “elemental” refers to a basic mixture of simple nutrients, such as free amino acids or small peptides, simple sugars, and low amounts of dietary fat. These diets tend to be more expensive per calorie than all other common diets, and are not complete and balanced for long-term feeding. However, they may be beneficial if an animal has concurrent food hypersensitivity. Standard parenteral nutrition solutions can be given in the event of severe acute pancreatitis. release of proteases or worsen prognosis. The provision of complete parenteral nutrition solutions is often difficult in practices not equipped with a fully staffed emergency and/or critical care unit or in those without previous experience with these formulations. Dogs with acute pancreatitis may fully recover, and may not display any histologic features or clinical signs of chronic disease. In such cases, a diet otherwise optimal for the pet’s age and health can eventually be fed. If the patient received a low fat diet during hospitalization, slowly transition the animal to the previous or intended maintenance diet. Do not make this transition until the owner has verified the patient is eating well and clinically stable after discharge. There are often no contraindications to extended administration of a low fat diet. Discontinue food transition and reevaluate recommendations if there is any evidence of lethargy, hyporexia, or abdominal pain. Owners should be counseled to avoid the risk factors highlighted at the beginning of this article (eg, significant abrupt food changes, ingestion of trash, table scraps, obesity). Low fat, no fat, or normal fat? 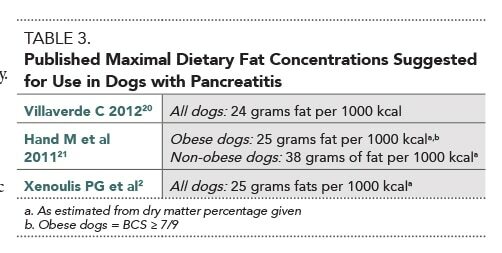 The evidence for dietary fat restriction in chronic canine pancreatitis is based on clinical impression and the published management of relatively few cases. The lack of prospective controlled clinical trials assessing fat tolerances in dogs with acute or chronic pancreatitis has resulted in a range of recommendations. Some specialists generically advise that a low fat diet be given,1,19 while others provide specific empirical maxima (Table 3). None of the values has a primary basis in scientific experimentation and as such should be interpreted cautiously. Moreover, the diets marketed and labeled for management of pancreatitis vary widely in nutrient composition (Table 1). KEY POINT: Based on available evidence, it is prudent to feed lower fat diets (< 30 grams per 1000 kcal) in order to assess an individual dog’s response. Diets with higher fat contents may be tolerated by some dogs as precise data are unavailable. Nutritionally responsive hyperlipidemic dogs should consume no more fat than necessary to maintain serum triglycerides in a normal range. These dogs should, however, minimally receive their recommended allowance of 14 grams of fat per 1000 calories, assuming a normal intake of food.10 Fat free diets are not appropriate because minimum intake of dietary fat is needed for absorption of fat-soluble vitamins and provision of essential fatty acids. The type of fat consumed may influence a dog’s response to a particular diet. Dietary fat may be saturated or unsaturated and have different lengths of fatty acid chains. For a further discussion on dietary fat, read Role of Dietary Fatty Acids in Dogs & Cats (September/October 2016), available at tvpjournal.com. In vitro studies have suggested that acinar cells are differentially sensitive to the types of dietary fat to which they are exposed, with saturated fats the most lipotoxic, polyunsaturated fats less so, and monounsaturated fats protective.23 Such studies have not been performed in veterinary patients or cell lines. Each capsule adds 1 gram of fat to a dog’s intake; therefore, omega-3 fatty acids should be used judiciously while monitoring clinical signs. Extended administration is required and, therefore, is only likely to be beneficial in patients with chronic pancreatitis. Published anecdotal recommendations have suggested restriction of dietary protein to less than 75 grams per 1000 kcal for dogs based on the stimulation of pancreatic enzyme secretion in response to amino acids and protein.2,21 However, there is no evidence that such a maximum is beneficial or necessary. In most cats, the underlying inciting cause of pancreatitis is not identified. It commonly occurs as a co-morbidity with other conditions, including those affecting the small intestine and liver. 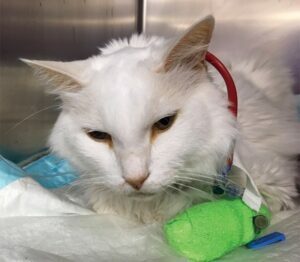 This so-called triaditis may occur in a majority of cats diagnosed with pancreatitis. 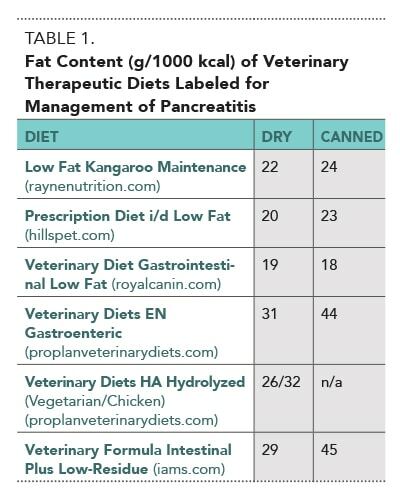 KEY POINT: Feline pancreatitis is not the same as pancreatitis in a small dog, and dietary fat restriction is generally not required in cats. The nutritional treatment of feline pancreatitis and associated conditions is centered on provision of adequate caloric intake for both short- and long-term feeding. Most cats require between 200 to 250 kcal daily during hospitalization and in their home environment. Anecdotally cats require increased time and treatment to begin eating compared with dogs. If a patient has a history of significant weight loss or a protracted period of anorexia, feeding tubes should be considered. Esophagostomy tubes (Figure 3) should be placed in cats with hepatic lipidosis or other co-morbidities and when a protracted recovery is expected. Appetite stimulant drugs are unreliable in many cases. FIGURE 3. Esophagostomy tubes help facilitate nutritional management of acute and chronic pancreatitis characterized by hyporexia. Dietary nutrient comparisons are best performed on a caloric basis (see Beyond the Guaranteed Analysis: Comparing Pet Foods, available at tvpjournal.com under Clinical Resources). Divide the as-fed caloric density (kcal/kg) on the label by 10,000. Divide the number from Step 1 by the number from Step 2. The National Research Council’s recommended allowance for fat content (g/1000 kcal) in canine diets is 13.8; less than 30 is considered low fat, 30 to 50 is considered moderate fat, and greater than 50 is considered high fat by the author. EPI can be managed with a variety of different dietary strategies but relies on exogenous pancreatic enzyme powders to aid in normal digestion. The relationship between pancreatitis and diabetes in cats is less clear, with insulin resistance secondary to increased adiposity being the primary risk factor. Cats with diabetes mellitus benefit from weight loss and, possibly, a low carbohydrate, high protein diet; neither would be detrimental to managing concurrent pancreatitis based on available knowledge. Small animals with pancreatitis should receive an assessment of their dietary history and nutritional status. Unfortunately, current knowledge is inadequate to provide a strong evidence-based recommendation on when and how to feed many patients. Dietary fat restriction appears to be a critical part of successful management of chronic disease in dogs, but its role in acute pancreatitis is less clear, and is generally unnecessary in cats. The definition of a low fat diet for patients with pancreatitis is not well established but may be less than 30 grams per 1000 kcal. Hyperlipidemic animals may benefit from restricted intake of fat to achieve lower serum triglycerides and cholesterol, but all animals require sufficient fat intake to ensure fat soluble vitamin absorption and to meet essential fatty acid requirements. When nutrition is elected for acute or severely affected patients, assistive feeding may be required. Current evidence suggests that enteral nutrition is preferred over parenteral nutrition unless there is a contraindication to luminal nutrition. Xenoulis PG, Suchodolski JS, Steiner JM. Chronic pancreatitis in dogs and cats. Compend Cont Ed Pract Vet 2008; 30(3):166-180. Xenoulis P. Diagnosis of pancreatitis in dogs and cats. J Small Anim Pract 2015; 56:13-26. Armstrong PJ, Williams DA. Pancreatitis in cats. Top Comp Anim Med 2012; 27:140-147. Lem KY, Fosgate GT, Norby B, et al. Associations between dietary factors and pancreatitis in dogs. JAVMA 2008; 233:1425-1431. Watson P, Archer J, Roulois A, et al. Observational study of 14 cases of chronic pancreatitis in dogs. Vet Rec 2013; 1:ec4912. Mohr AJ, Leisewitz AL, Jacobson LS, et al. Effect of early enteral nutrition on intestinal permeability, intestinal protein loss, and outcome in dogs with severe parvoviral enteritis. J Vet Intern Med 2003; 17:791-798. Qin H-L, Su Z-D, Gao Q, et al. Early intrajejunal nutrition: Bacterial translocation and gut barrier function of severe acute pancreatitis in dogs. Hepatobiliary Pancreat Dis Int 2002; 1:150-154. Qin H-L, Su Z-D, Hu L-G, et al. Effect of parenteral and early intrajejunal nutrition on pancreatic digestive enzyme synthesis, storage and discharge in dog models of acute pancreatitis. World J Gastroenterol 2007;13:1123. National Research Council. Nutrient Requirements of Dogs and Cats. Washington DC: National Academies Press, 2006. Hoffer LJ. Human protein and amino acid requirements. JPEN J Parenter Enteral Nutr 2016; 40(4):460-474. Johnson PA, Mann F, Dodam J, et al. Capnographic documentation of nasoesophageal and nasogastric feeding tube placement in dogs. J Vet Emerg Crit Care 2002; 12:227-233. Marik PE. What is the best way to feed patients with pancreatitis? Current Opinion Critic Care 2009; 15:131-138. Mirtallo JM, Forbes A, McClave SA, et al. International consensus guidelines for nutrition therapy in pancreatitis. JPEN J Parenter Enteral Nutr 2012; 36(3):284-291. Lodewijkx PJ, Besselink MG, Witteman BJ, et al. Nutrition in acute pancreatitis: A critical review. Expert Rev Gastroenterol Hepatol 2016; 10(5):1-10. Jensen KB, Chan DL. Nutritional management of acute pancreatitis in dogs and cats. J Vet Emer Crit Care 2014; 24:240-250. O’Toole E, Miller CW, Wilson BA, et al. Comparison of the standard predictive equation for calculation of resting energy expenditure with indirect calorimetry in hospitalized and healthy dogs. JAVMA 2004; 225:58-64. Mansfield C, James F, Steiner J, et al. A pilot study to assess tolerability of early enteral nutrition via esophagostomy tube feeding in dogs with severe acute pancreatitis. J Vet Intern Med 2011; 25:419-425. Williams DA, Steiner JM. Canine exocrine pancreatic disease. In Ettinger SJ,Feldman EC (eds): Textbook of Veterinary Internal Medicine. 6th ed. St. Louis: Elsevier, 2005, pp 1482-1488. Villaverde C. Nutritional management of exocrine pancreatic diseases. In Fascetti AJ, Delaney SJ (eds): Applied Veterinary Clinical Nutrition. Somerset, NJ: John Wiley & Sons, 2012, pp 221-234. Hand M, Zicker SC, Novotny BJ. Acute and chronic pancreatitis In Hand M, Zicker SC, Novotny BJ (eds): Small Animal Clinical Nutrition Quick Consult. Topeka, KS: Mark Morris Institute, 2011, pp 208-212. Castiñeira-Alvariño M, Lindkvist B, Luaces-Regueira M, et al. The role of high fat diet in the development of complications of chronic pancreatitis. Clin Nutr 2013; 32:830-836. Danino H, Ben-Dror K, Birk R. Exocrine pancreas ER stress is differentially induced by different fatty acids. Exp Cell Res 2015; 339:397-406. Park KS, Lim JW, Kim H. Inhibitory mechanism of omega-3 fatty acids in pancreatic inflammation and apoptosis. Ann NY Acad Sci 2009; 1171:421-427. Lei QC, Wang XY, Xia XF, et al. The role of omega-3 fatty acids in acute pancreatitis: A meta-analysis of randomized controlled trials. Nutrients 2015; 7:2261-2273. Bauer JE. Therapeutic use of fish oils in companion animals. JAVMA 2011; 239:1441-1451. McClave SA. Drivers of oxidative stress in acute pancreatitis: The role of nutrition therapy. J Parenter Enteral Nutr 2012; 36:24-35. Schoenberg MH, Birk D, Beger HG. Oxidative stress in acute and chronic pancreatitis. Am J Clin Nutr 1995; 62:1306S-1314S. Chan DL, Rozanski EA, Freeman LM. Relationship among plasma amino acids, c-reactive protein, illness severity, and outcome in critically ill dogs. J Vet Intern Med 2009; 23:559-563. Simpson KW. Pancreatitis and triaditis in cats: Causes and treatment. J Small Anim Pract 2015; 56:40-49. Simpson KW, Fyfe J, Cornetta A, et al. Subnormal concentrations of serum cobalamin (vitamin B12) in cats with gastrointestinal disease. J Vet Intern Med 2001; 15:26-32. Davison L. Diabetes mellitus and pancreatitis–cause or effect? J Small Anim Pract 2015; 56:50-59. Choate CJ, Hill RC, Scott KC, et al. Comparison of the guaranteed analysis with the measured nutrient composition of commercial pet foods. J Anim Physiol Anim Nut 2009; 93:141-141. Justin Shmalberg, DVM, Diplomate ACVN & ACVSMR, is a clinical associate professor, service chief of integrative medicine, and a small animal hospital medical director at the University of Florida College of Veterinary Medicine. He received his DVM from University of Wisconsin–Madison and completed an internship in veterinary acupuncture and a residency in small animal clinical nutrition at University of Florida.